She’s famously hard to impress, especially when it comes to her sartorial choices. 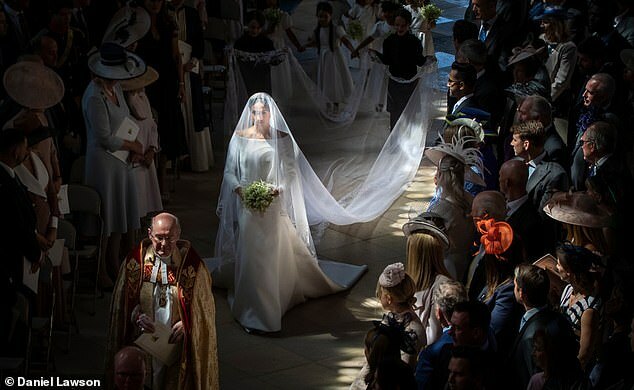 But Anna Wintour, 69, has been particularly taken by the Duchess of Sussex, calling her ‘an inspiration’. 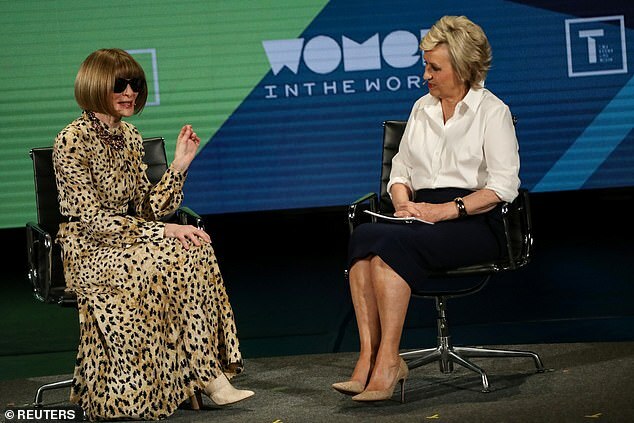 Speaking to former Vanity Fair editor Tina Brown, 65, at the 2019 Women in the World summit in New York the editor-in-chief of Vogue said: ‘She’s really bringing modernity to the royal family in a way that is inspiring’. ‘But I think, more importantly, she’s really bringing modernity to the royal family in a way that is inspiring’ she continued. 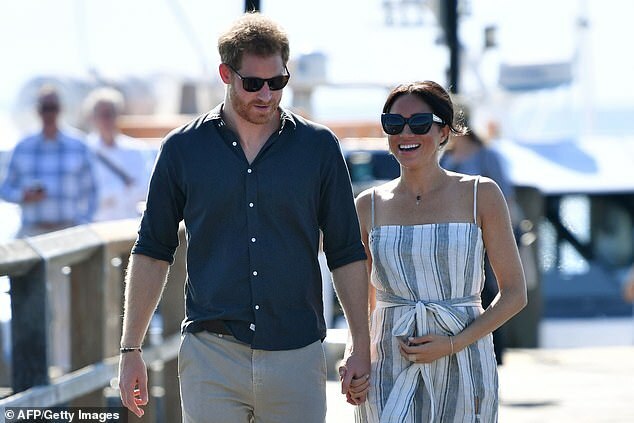 Anna, who is famous for her signature style of black sunglasses, a tea-length dress and statement necklace added that she’s considering changing up her ‘uniform’ thanks to the royal’s bold style choices. 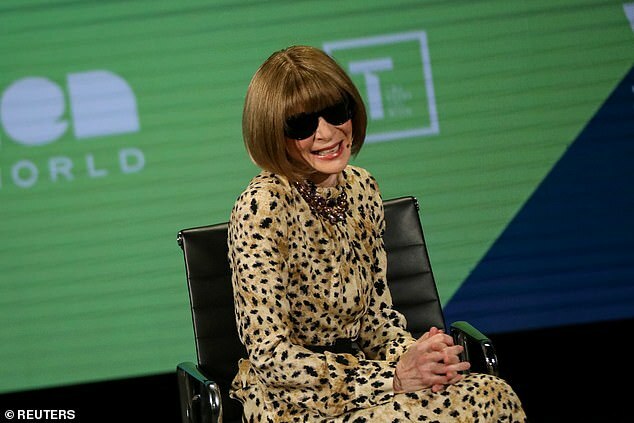 When Tina asked her how she ‘arrived’ at her look, and whether or not a uniform is the best solution for a working woman, Anna said it was ‘an entirely personal decision’. ‘It’s probably an easier decision to wear the same thing every day and not have to be concerned’ she continued. But Meghan wasn’t the only royal the journalist praised. She also recalled her lunch with Harry’s late mother Princess Diana, just six weeks before her death in August 1997. With Tina, Anna met at the Princess of Wales at the Four Seasons in New York, where she donned a mint green Chanel suit. Meghan wasn’t the only royal the journalist praised. 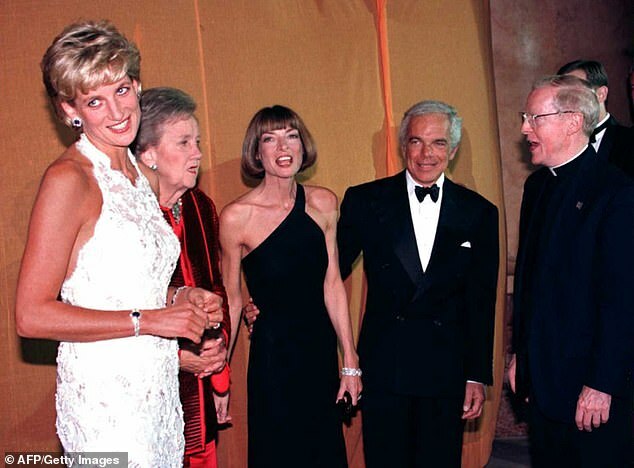 She also recalled her lunch with Harry’s late mother Princess Diana, just six weeks before her death in August 1997. Pictured: Anna with the Princess of Wales, Washington Post owner Katheryn Graham, designer Ralph Lauren, and Georgetown University President Leo J. O’Donovan in Washington D.C.
‘She looked incredible first of all. That was the most important thing and she looked fantastic’ the Vogue editor said. ‘I heard that she spent a lot of time deciding what to wear to that particular lunch. ‘I think that the part of her popularity was that Princess Diana really was so good with the media and was so in tune with them and welcomed them rather than standing back.